This Sunday's match on the Supporting Women's Football Blog comes from the 2nd Round of the FA Women's Premier League Cup an all South East Division One clash between Gillingham FC Ladies & Milton Keynes Dons Ladies. 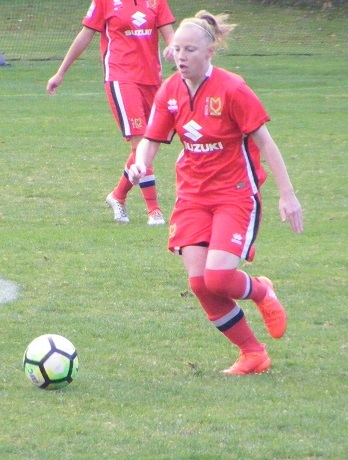 A Determining Round played at the start of the competition with the winning sides going on to contest the FAWPL Cup, the losing sides going into the FAWPL Plate. Gillingham FC Ladies are unbeaten in all competitions at the start of the season. Games in hand on all the sides above them in the table currently in 7th spot. Beat Southampton Saints Girls & Ladies 4-0 away from home in the Determining Round with a bye in the 1st Round now play Milton Keynes Dons Ladies 2 places above them in the league for a place in the last 16 of the FAWPL Cup. Felicity Gibbons returns to the club after spells with Brighton & Hove Albion WFC and Millwall Lionesses. 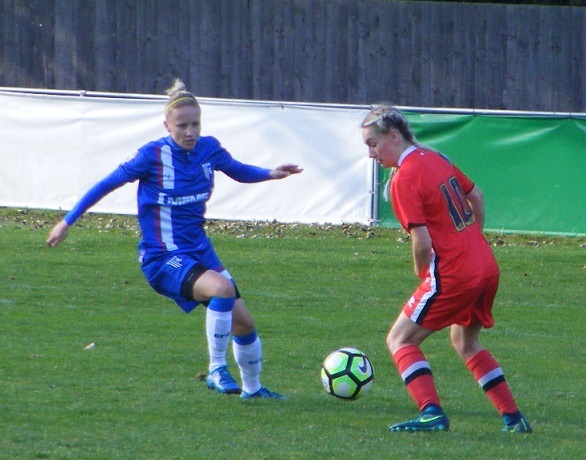 Vicky Ashton-Jones and Amy Taylor who both played a large part in helping Brighton & Hove Albion WFC to the FAWPL Southern Division title last season have also come in at the start of the season. Milton Keynes Dons Ladies are 3 points above Gillingham in the FAWPL South East Division One table in 5th spot with 4 wins from 7 league games so far this season. Have a new manager with James Honeyman taking charge of the 1st team. 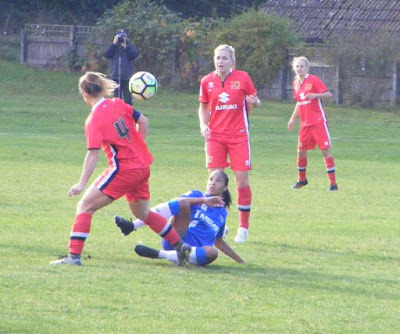 Beat Luton Town Ladies away from home in the Determining Round to enter the FAWPL Cup proper had a bye in the 1st Round. Kara Howes has resigned for the club after being with WSL 2 side London Bees. 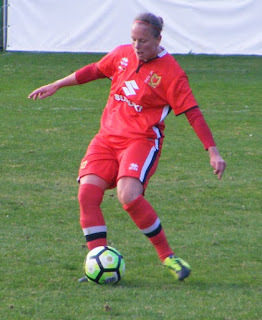 Rebecca Vass, Bedford Ladies captain last season was also signed at the start of the season. Gillingham FC Ladies have a new home this season, Corinthians FC. Just off the A2 through the villages of Bean and Longfield, ignoring the 'Road Closed' signs you find it just fine. In the countryside a picturesque setting you come to the Corinthian Sports Club a multi-purpose sports facility with a farmyard beyond, which you'll end up in if you follow the Sat Nav, however there is a gate which I suspect is unlocked on most match days at that end. A large clubhouse with a bar upstairs refreshments hot and cold available. The ground itself is very nice a small seated stand behind one goal plus a small stand on one side. More seating in front of the building housing the changing rooms in on corner overlooking a large pitch, plenty of width on this on, not the flattest but in great condition nevertheless. A bright sunny day clouds dotted around but a warm afternoon, will enjoy them whilst they last. Gillingham FC Ladies starting XI - Katie Startup, Ellie Manning, Grace Seely, Charlie Thurston, Vicky Ashton-Jones, Rachel Ahern, Jade Keogh (C), Katie Hardaker, April Bowers, Harriett Chapman & Felicity Gibbons. subs - Courtney Shanly, Bethany Nugent & Kallie Balfour. Milton Keynes Don Ladies starting XI - Emma Kirby, Kara Howes, Samantha Gillings, Leanne Doyle, Vicky Holland, Charley Clark (C), Heather McDonnell, Charly Wright, Hannah Barrett, Leah Cudone & Rebecca Vass. subs - Anna Loftus & Louise Naylor. Gillingham FC Ladies were without a few 1st team regulars but do have a large squad of players to draw from and with the games already building up the squad will be needed although absences and injuries see only 3 named on the bench, one of those goalkeeper Courtney Shanly with Katie Startup recently returned from Jordan having represented England Lionesses side in the U17s World Cup starting between the sticks. Milton Keynes Dons Ladies name a strong starting XI but a light on the bench with just the 2 substitutes to call upon. It's the visitors to kick-off the 1st half, Milton Keynes Dons Ladies kitted out in red shirts and shorts with a black and white band down the sides, along with red socks with a black and white band. 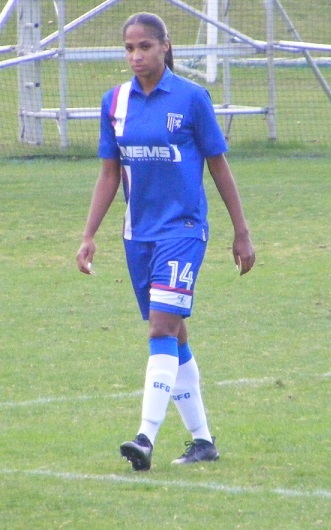 Gillingham lined up opposite wearing blue shirts with a vertical white stripe down the right, blues shorts with a white bands around the left leg and white socks with blue at the top. From kick-off, Milton Keynes look to get the ball out to Leah Cudone on the right bringing the ball down looks to knock it past Gillingham's Ellie Manning, the full back gets a foot in to win the ball, plays it in field into Katie Hardaker through the middle up to Felicity Gibbons leading the line holding the ball up has Harriett Chapman making a run on the left sends the ball out to her, Milton Keynes, Kara Howes running with her to win the ball tackles to put it out for a throw. Gillingham have started the match brightly have the ball inside the Milton Keynes half, Gibbons with the ball at her feet back to goal looks to link up with April Bowers on the right, her cross lifted up towards the penalty spot is headed clear of the area by Milton Keynes centre back Vicky Holland. Picking the ball up from half-way Gillingham captain, Jade Keogh carries it forwards rolls the pass into Bowers moving right, sends it on for Gibbons breaking into the box on the right side right of goal moving into the six yard box, looks to shoot the angle tight doesn't get a very good connection with the ball runs tamely into the gloves of Milton Keynes goalkeeper, Emma Kirby. Milton Keynes are sitting back inviting Gillingham on to them, defending the final ball played in towards the box. 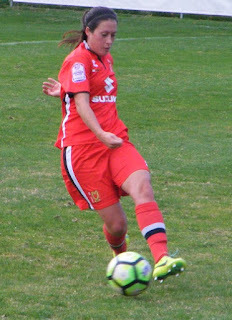 Bowers is over a free-kick won in front of the centre circle after Gibbons is fouled, plays the ball up in towards the D Milton Keynes, Leanne Doyle clears it with her head. Chapman pushes forwards with the ball on the right for the home side passes inside to Hardaker, aims her pass towards Gibbons wanting the ball inside the D, Holland marking her closely gets her foot in to push the ball away from the attacker. Milton Keynes are defending well, deep however the starting platform to get the ball into Rebecca Vass and Cudone up top is giving the Gillingham defence time to get bodies behind the ball. Gibbons is fouled in a central position a little closer to goal this time striking distance Bowers goes for goal sends her shot over the bar. A clash of heads between Howes and Chapman sees Milton Keynes down to 10 whilst the defender receives treatment for a small cut on her mouth. Attacking Hannah Barrett gets the ball over the top for Vass, Vicky Ashton-Jones tackles getting the ball into Chapman left driving forwards with the ball sends the ball in field is helped on to the right of the pitch the cross swept in near post Gibbons arriving leaps heads the ball down towards goal, Kirby saves getting down low to get hold of the ball. Milton Keynes, Hannah Barrett nipping in to win the ball inside her own half lifts it forwards over the top Vass breaking clear of the Gillingham defence gives chase, Startup is quickly off her line to come out of her area to kick the ball clear. 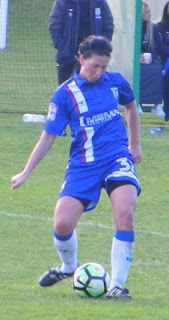 Rachel Ahern brings the ball on up the right attacking for Gillingham crosses early the ball into Chapman coming central closing in on the D, hits the shot on the turn blasting it against a Milton Keynes defender the block rolling towards Bowers 25 yards out hits the shot 1st time races wide of the target. Despite all of the chances in attack Gillingham have created so far 1st half the best one falls to Milton Keynes as they win a free-kick inside the Gillingham half inside the centre circle an opportunity to bring players forwards from the back, Barrett to deliver the ball lifts it high towards the players gathered left of goal inside the area, Doyle with a great run peels in behind the back jumping gets her head to the ball drives it goalwards, Startup near post makes an excellent save pushing the ball into the air falling back across the goal Vass following in leaps up trying to nod it home from close range her attempt cannoning off the crossbar bounces down into the six yard box, Gillingham scramble it clear. Milton Keynes come forwards again the ball with Heather McDonnell in midfield played on to Charly Wright left her pass forwards into the middle picking out Vass central 25 yards out gets the shot away angling away to the left Startup shifting across gets her gloves firmly around the ball. Cudone finding herself out on the left side has the ball at her feet drives forwards towards the Gillingham box rides 2 challenges before pulling the trigger 20 yards out pulls her strike wide of goal. Charlie Thurston fouls Vass up near half-way the free-kick awarded another chance for the visitors to bring players forwards, Barrett plays the ball long up towards the D, Wright goes up to head the ball, doesn't get a good connection, instead it is deflected wide right into the box, Holland gets hold of it plays the ball back in to Wright who wraps her foot over the ball meeting it on the volley her effort sails high over the crossbar. Late into the 1st half Milton Keynes make a change, Barrett can't continue is replaced by Louise Naylor. Cudone still out on the left gets forwards, Milton Keynes captain, Charley Clark giving her the ball moving forwards tries a 1 2 with Vass outside the box shooting sends the ball wide past the post from 25 yards out. Up the other end Gillingham are awarded a free-kick in a dangerous position on the left 22 yards from goal. Bowers over the ball goes for goal getting the ball over the wall, it falls straight into the gloves of Kirby. A late corner on the left for Milton Keynes following good work from Wright on the left the ball is angled in towards the near post headed on across the face of goal and out for a goal-kick far side. The last action of the 1st half. Gillingham have been the dominant side in the 1st half having had more of the ball and the attack however haven't a goal to show for it. Milton Keynes have sat back in defence and wit no room to get in behind have dealt with most things well played up into the box, have struggled to get their strikers into the game defending so deep waiting for Gillingham to make an error then nipping in on the ball sending it forwards, have had the best chance of the half hitting the crossbar. Anna Loftus is on for Milton Keynes at the start of the 2nd half with McDonnell the player off. Gillingham make a change at half-time too with striker Kallie Balfour coming on for midfielder Hardaker. A change of formation for the home side going to 3 at the back Gibbons dropping deeper with Balfour now leading the attack. The ball is with Balfour straight away down the right moving into space taking it on to the byline cuts her cross back into the six yard box is cleared behind for a corner by Holland. Coming towards the ball Balfour receiving the ball inside the box plays it back to Gibbons the corner taker, from the angle she sweep a shot in towards the far post, the Milton Keynes defender covering the post clears the ball. The clearance lands outside the box, Seely latches onto it her strike low into the crowded area is blocked then cleared. GOAL! Barely 5 minutes into the 2nd half and Balfour's introduction makes the difference the ball given to her as she moves to the left side turns and heads for goal a powerful run with the ball at her feet entering the box from the left gets the shot away firing the ball across Kirby at the near post and into the back of the net beyond 1-0. Coming forwards from the back Ahern covers alot of grass before delivering a cross into the box from the right on the diagonal in towards Gibbons who jumps for the ball but can't make contact as the cross flies over her. 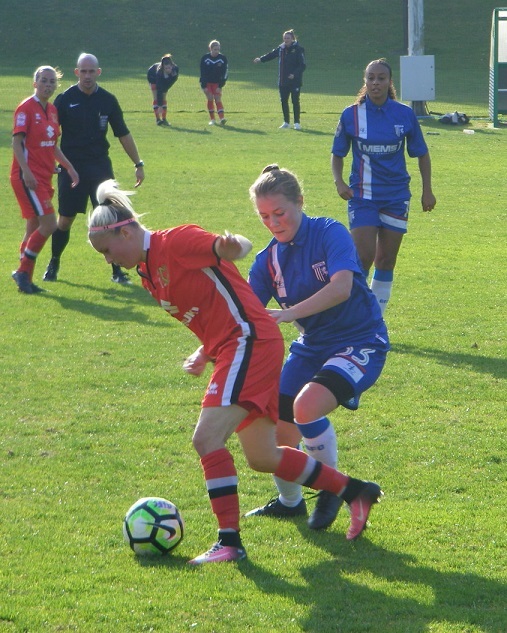 A sloppy ball at the back by Gillingham allows Wright to steal in take the ball on the left pushes on up the wing, Ashton-Jones gets back on her to tackle put the ball out for a throw. 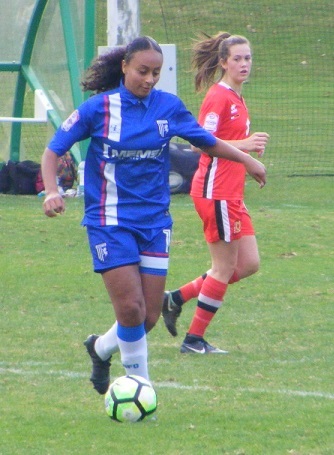 Taken quickly Wright throws it back to Gillings coming up to support the full-back sweeps a cross into the box players running in it's Ashton-Jones who gets her head to the ball to clear for Gillingham. Getting forwards down the right, Seely now playing wing back has Balfour making a run out to this side rolls the ball into her run the striker taking the ball on down the wing squares a pacey ball in along the face of goal, running along the ground Chapman has gotten into a central position the ball just evades her feet before being cleared far post. GOAL! Gillingham extend their lead as the 60th minute arrives the ball is brought into the Milton Keynes half by Keogh her forwards pass picking out Gibbons outside the area left of the D helps the ball on into the area with Balfour peeling off her marker into space right of goal, strikes the ball in centrally is straight at Kirby who gets down to gather the ball is unfortunate as the ball squirms through her gloves and under her body to roll into the net beyond 2-0. Naylor plays the ball forwards in beyond the Gillingham defence for Vass to chase into the box, Ashton-Jones on her shoulder, Startup looks to come forwards, Ashton-Jones takes no chances slides a foot in to push the ball away from Vass send it out to the left where it is picked up by Wright whips the ball back into the area, Vass dropping away to the far post area stoops to head the ball is off target but deflects off a defender for a corner. Vass plays the ball forwards for Cudone this time to chase into the area hesitation between Startup ad Thurston allows Cudone a chance to get a shot away is off balance however and can only prod the ball straight at Startup who pushes it away with her feet, the ball cleared to the right beyond. Wright gets her foot to the ball as it is delivered long into the box from the right, falling back as she volleys the ball left of goal sends her shot over the bar. Playing in a deeper role 2nd half, Gibbons comes on with the ball, no one closing her down lets fly from 30 yards out her shot flies over the crossbar. Gillingham make their 2nd change with Ahern coming off for Bethany Nugent a straight swap at the back. Keogh carrying the ball forwards passes to Balfour moving left in front of her, turning with the ball at her feet drives into the box shooting the ball lacks any pace doesn't trouble Kirby at her near post the keeper gathering the ball. Gillings bringing the ball on from the back up the left plays it on for Wright her pass forwards sees Cudone after the ball, shoulder to shoulder with Ashton-Jones the defender ends up on the ground as the ball runs behind a corner kick awarded. Is a great delivery from the left played in towards Clark inside the bx at the near post jumping gets a firm header on the ball turning it towards goal, Startup throws her gloves up the ball past her strikes the crossbar, deflected out to the left and cleared for a throw. A long crossfield ball plays Seely into space on the right taking the ball down into the corner puts the ball into the area a good delivery inswinging central under the bar 2 Gillingham plays closing in on her Kirby going up for it loses it under challenge dropping is cleared off the line by Howes at the far post. Kirby holds onto a powerful strike from Gibbons inside the box as Balfour plays her in receiving the ball on the left sending in on across the D into Gibbons whose shot is angled straight at the keeper. A good tackle from Ashton-Jones at the back for Gillingham to concede a throw on the left as Loftus goes forwards for Milton Keynes looking to get in behind as Wright sends the ball on up the wing. With Milton Keynes pushing players on late into the game Gillingham aren't interested in running the ball into the corner counter attack Keogh on the ball moves to within 25 yards of goal fires a low shot into the box is cleared the ball coming back to the Gillingham captain hits a swerving shot back in towards goal, moving across her line Kirby gets hold of the ball. As Milton Keynes blast a long range strike wide of goal up the other ed the referee blows the final whistle and it's Gillingham who advance to the last 16 of the FAWPL Cup. A good contest, Gillingham eventually coming out on top adjusting things 2nd half after a goalless 1st 45 minutes. Dominated play but couldn't break down a well drilled Milton Keynes defence sitting deep. The introduction of Balfour 2nd half altering things found space and with it 2 goals. Milton Keynes were 2nd best today despite hitting the crossbar from a set-piece in each half had less of the attack and few chances for their attackers to test the Gillingham goal. My thanks to Jenny and Julian from Gillingham as well as Laura from Milton Keynes for their help with the teams today, always appreciated.